"This is a quick and easy no-bake pie. Garnish with whipped cream or whipped topping. You can use a prepared graham cracker crust, if you wish." In a large mixing bowl, combine pineapple, dry pudding mix, and sugar. Stir well, then add sour cream. Beat on low speed for 2 minutes. Pour mixture into prepared pie shell. Chill before serving. Garnish as desired. Very easy and delicious. 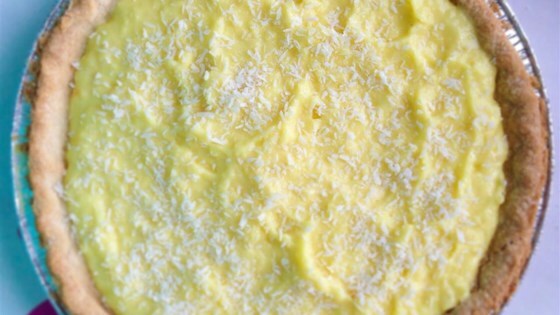 I used a graham cracker crust and topped it with toasted coconut flakes.